SOME of the finest hunting, shooting and fishing in the world is available in Scotland, and we can arrange to cater for your needs at short notice through our network of agents on Royal Deeside and across the country Scotland, of course, is the traditional home of golf, and North-east Scotland offers a selection of superb courses –including wonderfully challenging traditional links courses at Cruden Bay and Royal Aberdeen Golf Club - the sixth oldest registered golf club in the world, established in 1780. Scotland is The Home of Golf. This great game has been played on these shores for centuries and golf balls have been hit round Scotland's north-east coast for nearly as long as in any other part of the country. Today, north-east Scotland boasts over 70 golf courses. From stunning links courses to magnificent inland ones, there are plenty of choose from. The region's courses are often overlooked by golfers keen to play some of their more famous cousins. To overlook the courses of north-east Scotland is to miss out on some of the world's greatest rounds of golf. It is this choice and the golfing heritage that runs through every Scottish course which inspired us to establish Scottish Golf Trails. We can arrange golf facilities for our guests. Here are just some of the major golfing attractions in our immediate area. 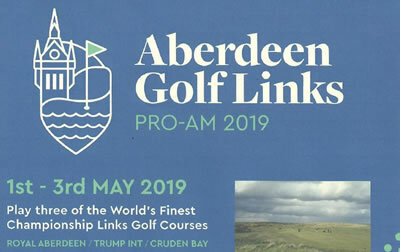 Royal Aberdeen Golf Club in Aberdeen, Scotland, was founded in 1780 as the Society of Golfers at Aberdeen and became the Aberdeen Golf Club in 1815. Until 1888 members played on the Queen's Links close to the city before moving across the River Don to the links at Balgownie. The Course was originally designed by the Simpson Brothers, Archie and Robert of Carnoustie and later re-bunkered and lengthened by James Braid. Hawtree & Company are now engaged as the Club's architects to ensure our classic links keeps pace with the modern game. Murcar Links is an attractive 18 hole course situated on the coast of Aberdeenshire, 10 minutes from Aberdeen city centre with superb views across the North Sea. Murcar Links has risen to No 35 in the Golf World Magazine ranking of the Top 100 Courses in Scotland. The course, originally designed by Archie Simpson and revised by James Braid, it is located on a classic stretch of links land with massive sand dunes, undulating fairways, and is covered in whins and heather with some magnificent views across the North Sea. Playing Murcar Links is a truly memorable and rewarding experience where each hole offers its own challenge. Cruden Bay Golf Club a traditional Scottish links golf course, originally designed by Tom Morris of St Andrews and Archie Simpson in 1899 and re-designed in the 1920’s by Tom Simpson and Herbert Fowler. Course offers an internationally famous golfing experience – old fashioned links golf at its best – on one of the best links courses in Scotland. Creating unique challenges demanding the skills of power, placement and fine judgement upon the discerning golfer. Newburgh on Ythan Links is a championship course of 6423 yards: par 72: CSS 72. It was established in 1888. The outward nine is characterised by natural hills and undulations, requiring a range of adroit shot-making to meet the challenge of traditional gorse-lined seaside courses. Set amidst The Great Dunes of Scotland, Trump International embraces mile after mile of spectacular Aberdeenshire coastline and guarantees the experience of a lifetime. Against a dramatic North Sea backdrop, the award-winning championship course offers breathtaking scenery and an unparalleled test of golf. The highly-acclaimed 7,400 yard, par 72 championship course is designed by renowned links golf architect, Dr. Martin Hawtree, and follows a classical pattern of two out-and- back loops of nine. Take your game to the next level. 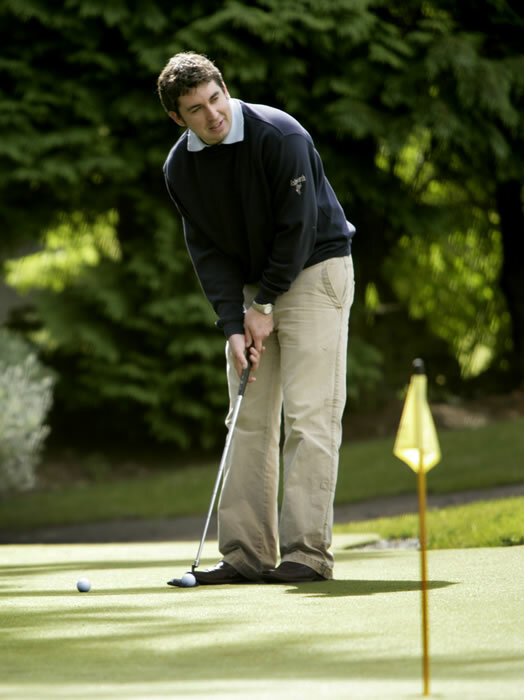 The Paul Lawrie Golf Centre is only 4 miles from the Marcliffe Hotel. 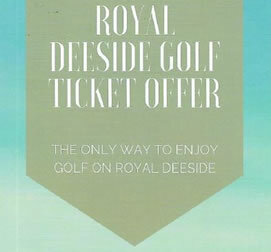 Set within the beautiful Royal Deeside the Paul Lawrie Golf Centre caters for the needs of all golfers. Boasting a nine hole par three golf course, a 27 bay driving range and a world class short game area, the Centre also has three PGA Coaching Professionals on hand to provide instruction in fully equipped private coaching bays. The centre also contains custom fitting bay, well equipped shop and friendly coffee shop with views over the golf course and beyond. We can arrange top-class wild salmon fishing for our guests, on the famous River Dee, which meanders just a few hundred yards from our location in the Royal Deeside Lower Valley. We offer a wide range of salmon and sea trout fishing packages in over 20 beats on the River Dee and River Don which combine to make the City of Aberdeen a unique peninsula -bounded by two rivers and the North Sea. Ghillies, equipment and suitable attire are all available at an attractive price from us on request. Alternatively, if you wish us to create an atractive package, we will tailor make it to suit your specific needs. You will also find that North-east Scotland offers several superb fishing rivers - including the River Ythan and River Esk. And many intriguing loch and trout fisheries are within easy reach. The Marcliffe Hotel and Spa is the optimal base for the most memorable of fishing breaks. Piscatorial bliss! Please note that these fishing facilities are subject to availability. The fishing season runs from February 1 through to September 30. Picture courtesy of The River Dee Trust & Dee District Salmon Fishery Board. Frequently referred to as Castle Country, the historic North-east of Scotland is home to around 1000 castles or castle ruins, providing a wealth of history to explore - from gruesome tales of battles fought, to strolls through romantic family estates. Each castle has a different story to tell. Let your mind wander back through the centuries to imagine just what might have taken place where you now stand, or get lost amongst the beautiful walled gardens where, if you're lucky, you might come across a traditional tearoom for a spot of delicious home baking. Aberdeenshire is home to Scotland's only dedicated Castle Trail - a selection of 17 unique castles. Experience the romance and history of these restored family castles, ruins and stately homes, by simply following the trail. With its distinctive white on brown signs and a blue castle logo, which leads you through the heart of Aberdeenshire, it couldn't be a simpler day out. A visit to any of the castles makes an ideal day out or navigate your way along sections of the trail for a longer break. With Aberdeen as your base, the highlights include the well-preserved ruins of Dunnottar Castle, near Stonehaven, perched on a dramatic cliff some 160ft above the North Sea. Fought over by Wallace and Cromwell, it was used as a set for Franco Zeffirelli's 1991 film of Hamlet. Heading north from Stonehaven on the A957 brings you to Crathes Castle, a few miles east of Banchory and Drum Castle – five miles further east on the A93. Crathes is a classic fairytale castle standing in superb grounds with a range of woodland trails on offer to help you explore. Inside, spiral staircases lead to rooms famous for their Jacobean painted ceilings and resident ghost, the Green Lady. Drum Castle combines a unique mix of a late 13th-century tower, fine Jacobean mansion house and later Victorian additions. Superb furniture and paintings are on display while the estate's woodland trails and exceptional walled rose garden are well worth exploring. Some 15 miles further north on the B977 stands Castle Fraser, one of the grandest castles of Mar. This magnificent building contains an evocative Great Hall, fine furniture and paintings. Enjoy the beautiful secluded walled garden, extensive woodland walks with fine views of the castle plus a children's adventure playground. The regal Balmoral Castle on Royal Deeside has been newly added to the Castle Trail to mark the Queen's Diamond Jubilee. You can enjoy a tour of the gardens of the Royal Family's Scottish home and drop in on various exhibitions. Royal Lochnagar Distillery one of the jewels in the Royal Deeside crown is situated beside her Majesty the Queen's Scottish home, Balmoral Castle, in Crathie. The distillery takes its name from the mountain, Lochnagar, which is a Munro, a mountain over 3000ft high. The Royal name was bestowed upon the distillery following a visit by Queen Victoria on the 12th of September 1848. At the end of this, the first ever distillery tour, Queen Victoria enjoyed a dram of mature Lochnagar Highland Single Malt Scotch Whisky. Standard guided distillery tour leaves on the hour (£7.50pp) including a dram of the Royal Lochnagar 12 Year Old. Pre-book for a range of longer tours (from £10pp) or the visitor centre on 013397 42700). Our tours (£15.00) with small groups are limited to just 12 people to ensure a luxury, personal experience. Your friendly and knowledgeable guide will explain how we create The Macallan’s rich spirit and introduce you to the ‘Six Pillars’ of The Macallan. After a thorough immersion into the world of The Macallan, you will experience a nosing and tasting of a careful selection of The Macallan whiskies, as well as their very foundation, our wonderfully rich new make spirit. Why not visit nearby Johnstons of Elgin Cashmere (14 miles) while here. George Smith licensed the brand in 1824 and founded this distillery in 1858. 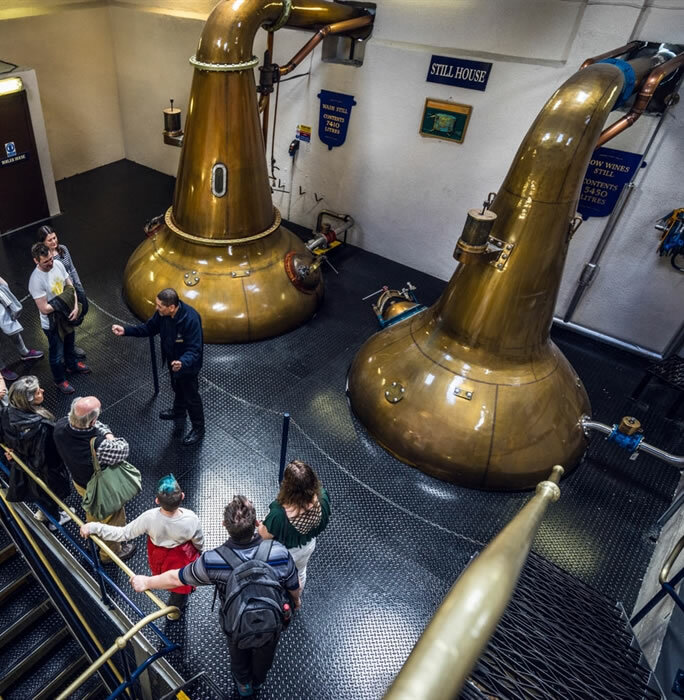 Standard, small group distillery tours run every 20 minutes, last 45 minute and are free, including a dram; longer tours (from £35pp) should be pre-booked. You can fill your own bottle straight from the cask, then cork, cap and label it. Open March-November.